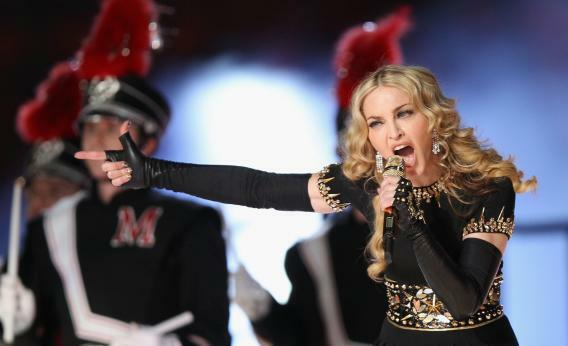 On the heels of Madonna’s glitter-nuke of a Super Bowl performance, Naomi Wolf wrote in The Guardian on Monday that Madonna-hate—which Wolf defines as “the reliable media theme [that emerges] whenever she steps out of her pretty-girl-pop-music bandwidth”—is based on a sexist rejection of an ambitious woman daring to consider herself a “serious artist.” Wolf identifies this disdain within the decidedly negative critical reaction to Madonna’s new film W.E. (which she directed and co-wrote), leading Wolf to question why such ad hominem hateration seems to be reserved especially for Madge. The answer? Because she must be punished, for the same reason that every woman who steps out of line must be punished. Madonna is infuriating to the mainstream commentariat when she dares to extend her range because she is acting in the same way a serious, important male artist acts. Wolf strains to portray Madonna as something she calls the “Nietzschian creative woman,” presumably an allusion to the philosopher’s sense that a “genius” should not allow his “will to power” to be constrained by the limiting morality or social expectations of the larger culture. In Wolf’s view, we gladly afford male artists the latitude to explore work (often with mediocre results) beyond their home-medium, but hold contempt for women who do the same. While I agree with Wolf that Madonna-hate is a real and strange thing, I have to dispute her eager jump to sexism as the explanation. Not because women aren’t often judged by different rules than men in certain areas—double standards are our culture’s bread and butter; it’s just that Madonna, at least in the way that Wolf appraises her, is not a genuis in any medium. I’m not saying anything new by pointing out that Madonna isn’t a particularly talented singer or dancer (and though I haven’t yet seen W.E., based on previous efforts I’d say that she doesn’t really shine around a camera either). But who ever said being a pop icon required actual talent? To be a superstar, all one needs—and these Madonna has in spades—is a cultural prescience and the lucrative gift of self-promotion. We don’t hate (or, for that matter, love) Madonna for her artistic genius; we’re just jealous of the fact that she’s been so successful without it. Speaking less glowingly of artists at another point in his writing, Nietzsche contended that they are no more than the “pre-condition, the womb, the soil…from which [art] grows.” External influences use the vessel of the artist as a way of manifesting themselves in the world. To my mind, this characterization is far more accurate a description of Madonna than Wolf’s overdriven “Nietzschian creative woman.” Like Andy Warhol and others before her, Madonna is a master curator and synthesizer (a less generous word might be thief). She adapted voguing from a relatively unknown gay African-American subculture in New York and packaged it to sell, just as she has more recently channeled the latest trends in pop music into her own work via producers like Timbaland and cameos from new artists like Nicki Minaj. I wouldn’t be at all surprised to hear assimilated dubstep infusions on the forthcoming album MDNA. The fact is, Madonna plays the fame game better than anyone; it’s just that her longevity has caused the internal machinations to become increasingly exposed. Certain people (including myself) get a thrill out of peeking behind the curtain—we’re riveted by the ambrosial combination of camp and connivance—while others are turned off by the lack of something romantically called authenticity. I revel in the audacity of Madonna’s ability to make millions from derivative and/or middling art, while “haters” find her gall and enduring popularity offensive. Anyway, there’s no accounting for taste; the point is that neither perspective has much to do with gender. The underlying motivation of Madonna-hate could just as easily be directed at a man (the artist Damien Hirst comes to mind) or really anyone who refuses to let pesky little things like genuine talent or originality get in their way. As Madonna says in the song, “Every record sounds the same / gotta step into my world.” Like it or not, it’s a command, not an invitation.